This post contains affiliate links, Kidz Buyz may be compensated for purchases made through these links, for more information, click here! The new 2016 postage rates have led to a number of online shipping changes and they are causing ALOT of confusion! Previously, most people used Paypal for packages under 13 oz and some priority packages taking advantage of Commercial Base Pricing. For Padded Flat Rate Envelopes and Regional Rate Boxes, USPS.com provided the same discounts, saving sellers quite a bit on Priority. But starting January 16, 2016, this pricing is no longer available at USPS.com, leaving sellers scrambling for more cost effective options. If you are new to online shipping, to ship from Home, you will need some supplies. Amazon is a great source for reasonably priced shipping supplies. You can always go to Staples, but you will find that their supplies are significantly more expensive than buying ahead at Amazon. A scale: A kitchen scale works just fine, but if you do not have one, then you can usually purchase a postal scale for under $20. This is the biggest investment you will make in shipping online. Polymailers: These are plastic mailers that are used to package your shipment. They are about $8/100, so extremely inexpensive compared to manila envelopes, they also hold up much better than paper when packaging clothing. The mailers that you receive can vary in quality. Lately I have been using these colored mailers because they are sturdier than recent orders I have made of the white mailers. Shipping Tape: Even if you are going to use labels, you will want to have some of this around to make sure that a package is secure or that there aren’t any loose edges that could catch in sort center machinery. Shipping Labels: Much easier than printing on paper and taping. At around $0.04/label, it’s well worth the extra expense. Clear Bags: Even when using a polymailer, you should always put the contents inside another plastic bag. This helps to prevent damage in the event that the outside mailer is damaged. You can re-use bags that you get from online clothing orders, but these are a great option if you don’t have any available. More cost effective that ziplock bags from the grocery store. Printer: You will need a printer! If you don’t already have one, consider one that allows you to print wirelessly from your phone. I love our Epson Printer and have been happy with the cheapy refills! Once you have your supplies and have made a sale, it is really easy to prepare your shipment. Fully package the items. Weigh the items (in the shipping packaging) on your scale. 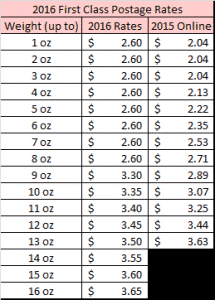 If it is under 16 oz, go to PayPal (we will discuss over 16 oz next). Next to the transaction, you should see a “print label” button. Enter the shipping weight and click the purchase button on the bottom of the screen. Print the label, affix to the package and you’re all set! You can leave the package in your mailbox, in a blue box (if under 13 oz) or schedule a pick-up online. The tracking for your package automatically uploads in PayPal and your buyer is notified of the shipment. , there is the option to notify the recipient of shipping by providing their email address. This is a great way to let the buyer know that the package has shipped and ensure that they have the tracking available. The rate between a cardboard Flat Rate Envelope and Padded Flat Rate Envelope is different. Using the wrong type of postage could result in postage due when the buyer receives the package. It should also be mentioned that not all Priority boxes and envelopes are flat rate! Be sure that if you are using Flat Rate postage that “Flat Rate” is printed on the box or envelope that you are using. It can be a costly mistake! Previous Post EXPIRED Kid’s Uggs from $52!!! Next Post Tea Collection Sale! Save Up to 25%! FYI Regional Rate boxes are still available on USPS. Not sure of the pricing, but it’s now only Regional Rate Box A & B. When they did the original update, they accidentally did away with them, but their current note says that they have since been put back on the site. Thanks! When I checked this morning, it said it was only available in the the click & ship app, which is a desktop software, but I see that it’s been added back!